According to new research by Savills, Areas of Outstanding Natural Beauty in the UK have been ranked as one of the top five attributes of a property, attracting almost a 50% premium[i]. Nestled on the edge of the Cotswolds, a declared Area of Outstanding Natural Beauty, is the idyllic village of Gretton, Gloucestershire. This desirable location has welcomed a newly launched collection of distinctive properties at Hillcroft, by Spitfire Bespoke Homes, which are now available to purchase off-plan. Featuring an eclectic mix of three and four-bedroom detached, cottage and bungalow style properties, Hillcroft occupies a prime position in a beautiful countryside setting, offering far-reaching views over open fields. Perfect for families and downsizers alike, the homes blend perfectly with the village’s architectural heritage, combining charm and character. Typical of the quaint timber-lined buildings and stone cottages in the area, the homes at Hillcroft feature Cotswold stone, red brick and render. Situated on a private road, the collection is fronted by a traditional thatched cottage and is gently lit in the evenings by the soft glowing ambience of low-level bollard lighting. Comprising a selection of detached three, four and five-bedroom homes, each residence at Hillcroft benefits from Spitfire’s signature specification, including individually designed kitchens with Neff appliances, bespoke feature staircases, underfloor heating and contemporary Villeroy&Boch sanitaryware. Gretton is ideally located less than two miles from the beautiful market town of Winchcombe, where a range of local amenities and independent shops can be found. 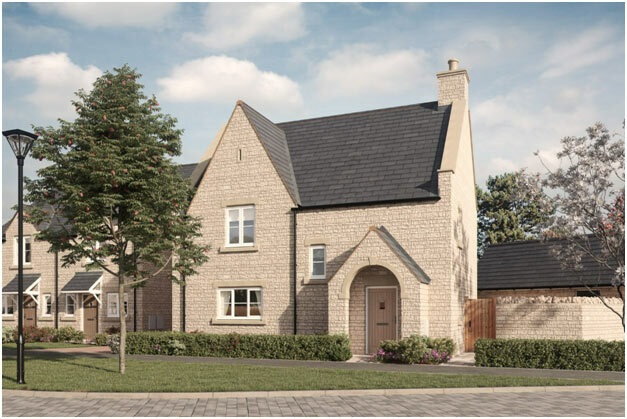 Slightly further away, epitomising the classic Cotswold charm of this Area of Outstanding Natural Beauty is Broadway, home to the iconic Broadway Tower. For further shopping and leisure pursuits, the regency spa town of Cheltenham, is home to the Promenade, voted one of the best shopping streets in the UK and Cheltenham Racecourse, which hosts the prestigious Cheltenham Gold Cup. Well-equipped for families, the area offers a selection of excellent state and independent schools. Gretton Primary School is a short drive away and is rated Good by Ofsted whilst Winchcombe School provides good secondary education. Further afield, Cheltenham is home to The Richard Peta School, Berkhampstead School and top independent boarding school, Cheltenham College. Hillcroft has strong rail links with regular trains from Cheltenham Spa Railway Station serving Birmingham and Bristol in less than 40 minutes, as well as direct trains to London Marylebone in approximately two hours. There are also direct routes to Cardiff, Nottingham, Leeds and Manchester. For those travelling by car, the A46 and M5 are also within easy reach. Prices currently start from £450,000 at Hillcroft. The sales office is open Thursday to Monday between 10.30am and 5pm. For more information, please visit www.spitfirepg.co.uk or call 01242 620170.